The American Geriatrics Society (AGS) today announced that Jane Potter, MD, AGSF, Chief in the Division of Geriatrics at the University of Nebraska Medical Center (UNMC), will be honored with the 2018 Dennis W. Jahnigen Award celebrating work to train more health professionals in the care we all need as we age. "Over the past 35 years, Dr. Potter's tireless work has advanced education for thousands of health professionals," said Ellen Flaherty, PhD, APRN, AGSF, AGS Board Chair. "It would be difficult to locate a geriatrics clinician trained in the last two decades whose education has not been shaped in some way by Dr. Potter's influence." A dynamic force driving geriatrics education, Dr. Potter has not only led medical education at UNMC but also has expanded the scope of her work to lead national efforts aimed at increasing the prestige and prominence of the geriatrics workforce. Dr. Potter is a co-Principal Investigator for the AGS's Geriatrics Workforce Enhancement Program (GWEP) Coordinating Center–a strategic resource supported by The John A. Hartford Foundation for 44 organizations in 29 states working through the only federal program focused on increasing the number of doctors, nurses, social workers, and other healthcare professionals trained to care for America's older adult population. Across her career, Dr. Potter has led several other impactful education programs through the Donald W. Reynolds Foundation and the Health Resources & Services Administration (HRSA, which also operates the GWEP), including the Geriatric Medicine and Geriatric Dentistry Fellowship Program and the Nebraska Geriatric Education Center. After completing medical studies at the Creighton School of Medicine, residency at George Washington University, and advanced geriatrics training at the National Institute on Aging, Dr. Potter returned to her home state of Nebraska in 1982, where she has been a local and national champion for geriatrics education ever since. Now the Neumann M. & Mildred E. Harris Professor of Geriatrics and Gerontology in Internal Medicine, Dr. Potter is a past AGS President and Board Chair and Deputy Director for the AGS Geriatrics-for-Specialists Initiative, another John A. Hartford Foundation-funded program which works to ensure all health professionals have a basic understanding of the unique skills needed to care for older people. Across her career, Dr. Potter has published numerous research articles and book chapters, and has worked for the AGS on developing its educational content, including Geriatrics at Your Fingertips and the Geriatrics Review Syllabus. The late Dennis W. Jahnigen, MD, was a compassionate geriatrician and acclaimed educator who dedicated his life to training future leaders. Today, his namesake award recognizes an AGS member, like Dr. Potter, committed to working with students and advancing geriatrics education in schools of health and medicine. 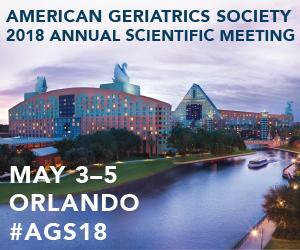 It is one of several honors conferred by the AGS at its Annual Scientific Meeting–held this year in Orlando, Fla., May 3-5. For more information, visit Meeting.AmericanGeriatrics.org. The late Edward Henderson, MD, was a renowned geriatrics researcher and physician and an instrumental leader for the AGS. The Edward Henderson Award is conferred upon a distinguished clinician, educator, or researcher who also delivers the Henderson State-of-the-Art Lecture on a topic related to the body of his or her work at the AGS Annual Scientific Meeting. Surrounded by low achievers -- High on positive emotions?